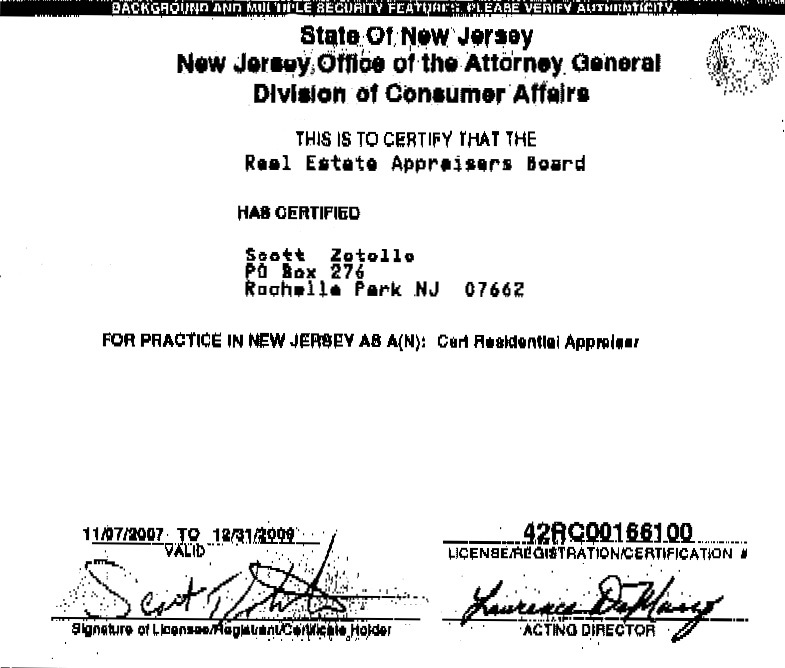 Mr. Zotollo has appraised and reviewed real estate properties in the New York/New Jersey area since 1993. His expertise lies in the appraisal of residential single family, multi-family, and condo/co-op type properties. He is currently in process of obtaining a Certified General license for appraising all types of commercial properties. “Zots” can supply appraisals via the internet via “pdf” format expediting the process. Associations include an “IFA” designation in the “National Association of Independent Fee Appraisers”. He is also a state certified residential appraiser fulfilling all requirements by the states of New York, New Jersey and Florida. 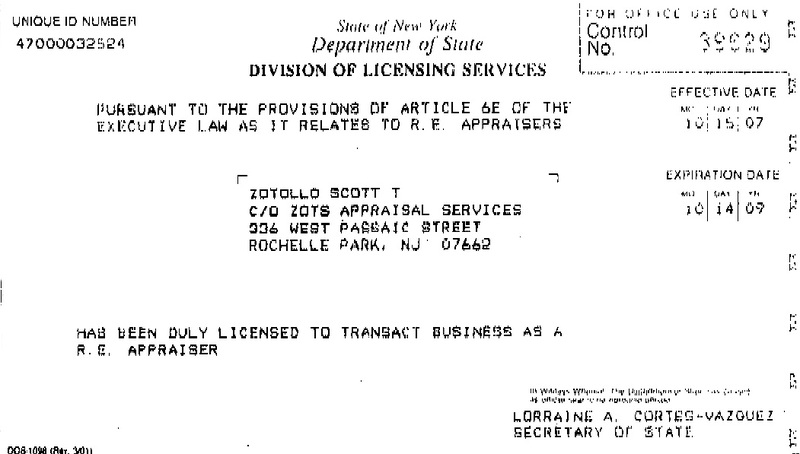 Scott is also currently on the “Lender Selection Roster of Appraisers” for the Department of Housing and Urban Development (HUD) in New Jersey and New York. R-1, Intro to Real Estate Appraising, R-2, Preparing a “URAR,” R-3, Uniform Standards of Professional Appraisal Practices, NAIFA 4.7 HUD, 1.3A Construction Terminology, 1.1 Dissection of a Residential Appraisal Report, The New FHA Handbook & Practice Exam, Appraisal Regulation & Underwriting Seminar, Uniform Standards 5.0, Attacking & Defending an Appraisal in Litigation, 99.2 FHA Appraisals & Changes, Mckissock, Inc FHA appraising today, National USPAP Equivalent 2003/05, R-103-Appraising Small Residential Income Properties, General Demonstration Appraisal Report Writing, Tax Appeals (2007), NAIFA USPAP changes and appraisal fraud, GAIA60 General Appraisal Income (2007), Market Analysis and Best Use (2007), Environmental inspection courses. 7 hour USPAP recertification credits. Mr. Zotollo continually attends various seminars, courses, and networks, with the “National Association of Independent Fee Appraisers.” Scott is very active in the real estate market/investing and has tangible experience and knowledge of the ever-changing trends and market conditions.